The Gruenbeck GENO-break®-System IV combines a Hielscher ultrasonic processor with intense UV-C light for continuous hot water system disinfection. Hot water supplies and pools can bear Legionella bacteria, pathogens and other micro-organisms. Legionella is known to cause Legionellosis. To fight the dangerous Legionella bacteria in hot water systems and secure a safer showering environment the Gruenbeck company has developed the GENO-break® system. This innovative system uses Hielscher ultrasonic technology in combination with UV irradiation and has solved the Legionella problem for more than 150 hot water installations in Germany. Legionella can be fought in many ways, such as thermal disinfection, where the water in the system is heated up to 70 °C for several minutes. One of the biggest disadvantages with this method is that it is discontinuous and impossible to apply to hot water systems with long pipes or dead-ends. Any Legionella left in the system will grow and reproduce. For this reason, the GENO-break® system is a continuous water treatment method and provides security 24h a day, 365 days a year. By this, the level of Legionella is held permanently low. 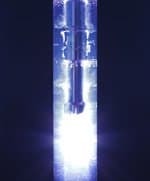 UV-disinfection has been used for many years. The UV-light inactivates the Legionella bacteria in the water. However, Legionella bacteria lives in host organisms such as amoeba, too. In the amoeba the Legionella bacteria grows and reproduces itself. The amoeba is resistant towards UV-light, chlorine, ozone and heat. 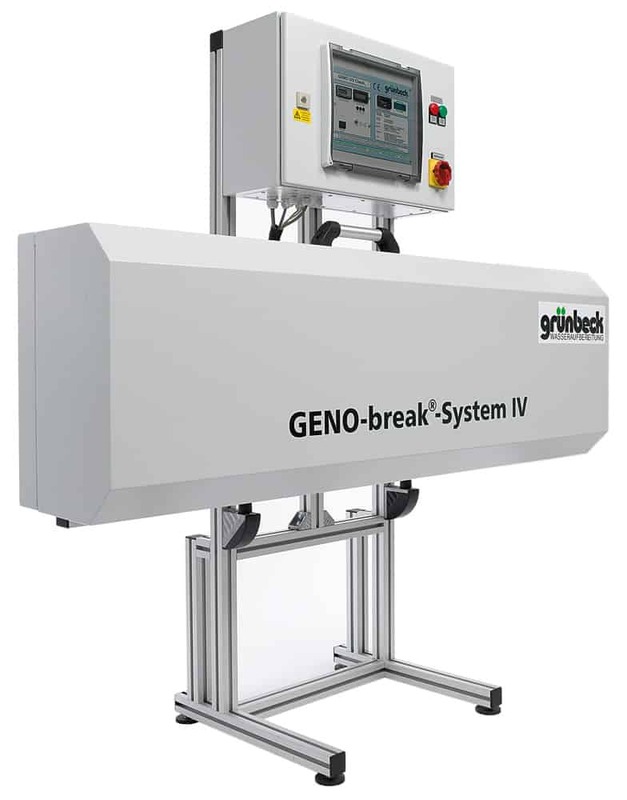 The Gruenbeck GENO-break system is designed as a two zone system. The first zone disrupts the host organisms (i.e. amoeba) by use of Hielscher ultrasonic processors. Ultrasonic cavitation breaks the cell structure of the organism and exposes the Legionella free and vulnerable in the water. 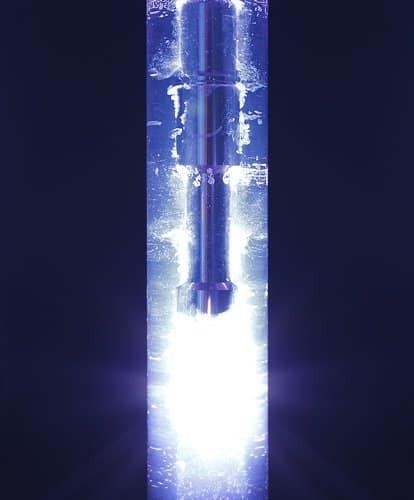 In the second zone the water is radiated with UV-C light that inactivates the bacteria. The GENO-break®-System IV is generally used for hot water systems of 500 liters or more. It combines ultrasonication with UV-C light in a soundproofing enclosure. The system is continuously monitored by an electronic control. This includes temperature monitoring. Legionellosis is an infectious disease caused by Legionella bacteria. Legionellosis takes two distinct forms: Legionella pneumonia (Legion Fever) or Pontiac fever. Symptoms include high fever, severe breathing difficulties, confusion, heavy headache and cardiological and vascular problems. It can be fatal if not diagnosed early and medically treated. Gruenbeck is the professional provider for solutions in the field of water treatment for residential applications, swimming pool technology, hygienic/health technology, food/beverage industry, central power stations and water supply. The Gruenbeck group of companies successfully operates on a global scale. A total of 700 employees work at the company’s headquarters and in more than 70 affiliated companies. Gruenbeck products include the GENO-break system to fight Legionella, standardized membrane technologies such as GENO-OSMO-MSR or the filter series BOXER. Wire and cable cleaning system for removal of oil, soap, or dust. Learn more about the chemical applications of our ultrasonic devices! We would like to see you coming back. To bookmark this page, please press Crtl + D.